This may perhaps be a niche case as I’m aware there aren’t many folks than have braved split-domain configuration with Lync on-prem and Lync Online, but to those that have (and still see the value in this type of deployment, which even without telephony there still is I might add), you are likely at some point to get the request for enabling Lync-to-Skype connectivity. If you’re looking for more information on how to deploy a regular on-premises enablement of Skype, I won’t be covering that here as Microsoft have an extensive deployment guide. What I’m going to cover is how to go about this process when you’re deploying (or have already deployed) split-domain. 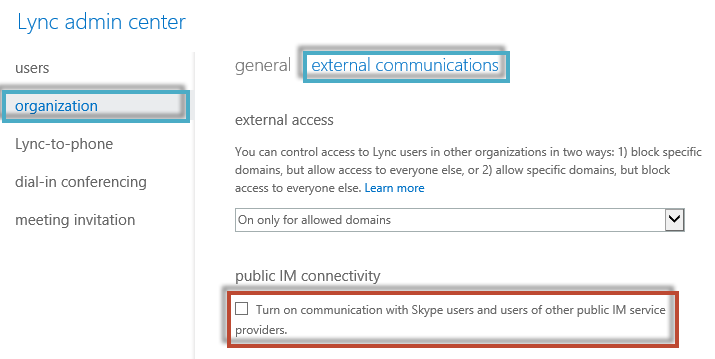 The right way, enabling Skype connectivity prior to adding your domain to Office 365. 1. Log into Office 365 as an administrator, then head for the Lync administration page. Once here go to Organization -> External Communications. Next disable public IM connectivity. 5. Once you’ve received your email confirmation then you’re all set and you can re-enable the setting you disabled in step 1!